There are a few little coverups to be found in this south swell…and this shot perfectly illustrate’s today’s quote: “I have learned to be satisfied with whatever I have”. Think on this one for a while, really chew on it…we always think that the grass is always greener on the other side of our perspective. 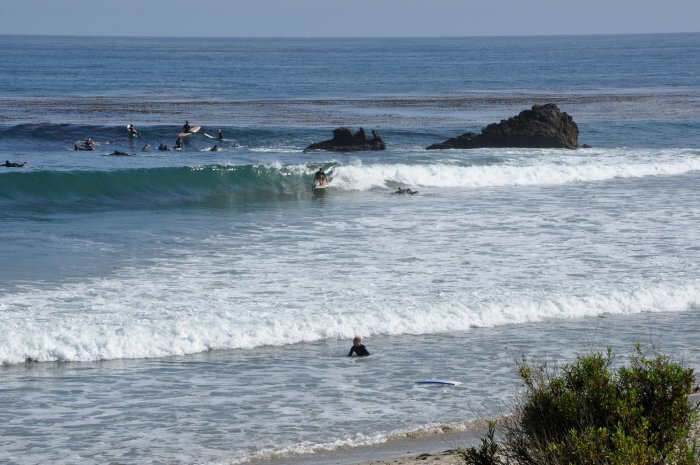 This break is only waist-high, but I am sure that that other spot is at least headhigh. We tend to want what we don’t have, at the expense of all that we did to get to where we are. We can be so A.D.D about life. I tend to think of things in relation to my life’s perceived continuum projecting before me for another 60 years…but it could all end today, this could be my last wave. Why do we run so fast to get to the finish line, why not enjoy the ride…even if it is just waist-high. Even if it’s only waist high, you can crouch backside and suddenly the wave is almost overhead! Yipee! OTOH, this south doesn’t look like it will propagate into Santa Cruz so well. Enjoy it down south!